This year — like many rapidly growing startups — is a year of major international expansion for Tilt, a startup centered around funding projects that is well on its way to being worth $400 million. Tilt serves as a way for people to raise money ahead of an event happening — such as funding T-shirts for a sorority or raising money for a school charity event. Users commit to paying for a project, but it has to hit a certain level of funding before anyone pays for the project. But in many ways the service mirrors a social network that builds on the same principles of sharing and communications. And after finding a spot in college campuses that are raising money for smaller events, Tilt is setting its eyes on international markets that could help propel its business even further. The company launched in Canada last year and that market is already growing faster than the company grew in its first 12 months in United States, Tilt CEO James Beshara said. The company has soft-launched in the United Kingdom. Tilt has also brought on Oli Jung, who that helped Airbnb grow internationally, as a consultant to help it expand to new countries. Jung is also an early investor in Tilt. Tilt has also raised a new round of funding that values the company at $400 million, according to our sources. But that isn’t really that much of a surprise given the costs of international growth. It requires hiring people who know the regions well, and the company has to expand its college ambassador program — one of its strongest areas of growth — at universities abroad. Tilt already has around 400 college ambassadors, but it expects to have more than 1,000 by the end of August. In many ways, the usage abroad is similar to the United States. But Beshara and his team are approaching each country with “eyes wide open,” he said, expecting there to be some differences in the way people use the service. Indeed, even in Canada, there are differences in the way people raise money on Tilt, with users there being more conservative than their American counterparts. Like many startups expanding internationally, the goal of launching in early countries is to build a playbook that can be applied to new ones. Pinterest is a good example of a company that’s looking to do something similar as it expands to countries like Japan and Brazil, and already 40 percent of Pinterest users are outside the United States. There are around 6.7 billion people outside of the United States, so it’s not really a stretch to imagine that international markets will quickly become the largest source of Tilt’s business, even by the end of the year if it continues to expand to new countries at a decent clip. Expanding to new countries and building those playbooks for international expansion as quickly as possible is going to be important to a company like Tilt, which would could leverage a first-mover advantage into building a lot of buzz for the service. But still, the company continues to grow at a healthy rate in the United States and Beshara expects it to do so for the foreseeable future, even as it rapidly expands its international footprint. The challenges will be different from other networks expanding internationally. Tilt has to deal with regulatory issues surrounding payments that other startups expanding internationally don’t have to deal with. But unlike Airbnb, Tilt can lean on companies like Stripe that have already solved those problems, but didn’t exist a few years ago. Beshara said he hopes to be able to spin up Tilt’s presence in new countries in 45 days once the service soft-launches in that country. Expanding internationally brings another challenge with it as well: making sure people working for Tilt abroad still feel like they are working for Tilt, and not on an island disconnected from the company’s home base. That job still requires people that are more self-starters, but it’s important to maintain the connection to the company, Jung said. The next region in Tilt’s sights in Asia, one of the largest potential markets that already has a large number of peer-to-peer payment networks. Tilt’s investor Jeff Jordan has plenty of experience expanding in markets abroad thanks to his experience at eBay and PayPal, and has served as a mentor to Beshara as he builds out his plans to expand to new countries. And Tilt, too, represents a sort of future-facing payments service, rather than other services like Venmo, which see a lot of use in paying people back. To be sure, Tilt is not the only startup that is creating some noise in the crowdfunding space. 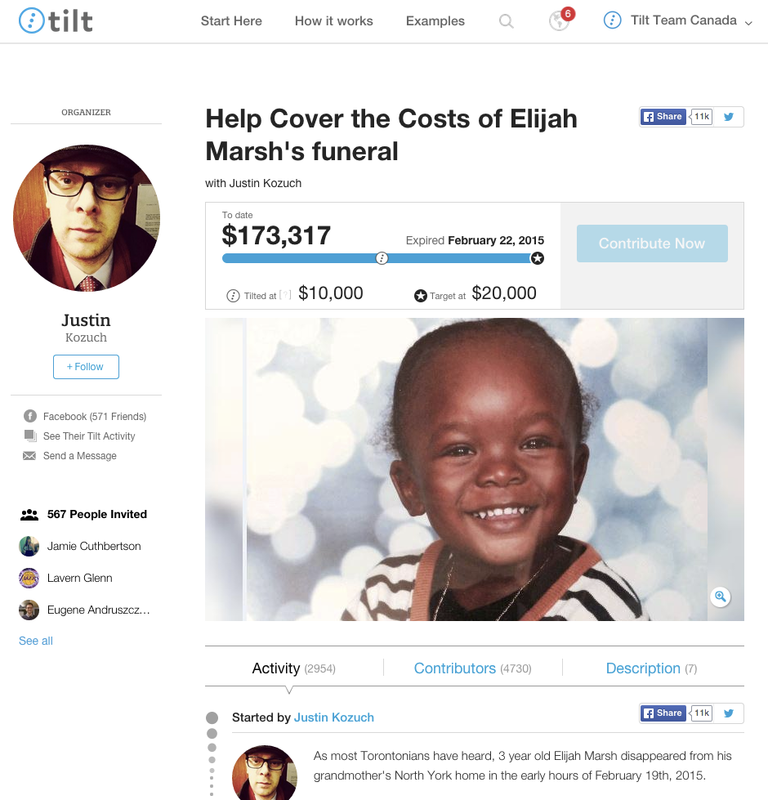 Most recently we reported that GoFundMe is raising at a $500 million valuation. With lots of capital flowing in the space, it’s clear that Silicon Valley sees a lot of potential in these kinds of services that goes beyond simply crowdfunding. Tilt’s challenge will be getting to those regions first and establishing its presence, and then finding out how to replicate that success as it continues to grow internationally.